The dream of Mulino di Gragnano: the production of high quality pasta bringing together craftsmanship and technological innovation. In search for a reliable partner to help them produce authentic Gragnano pasta made in the traditional way, they opt for Storci that is one of the top suppliers of pasta machines in Gragnano. A semi automatic line for short and long pasta was bought. The story of the artisan pasta factory “Il Mulino di Gragnano” was born in the parish church of San Leone II in Gragnano, gathering place for six young people in their late twenties,: Alfredo, Luigi, Cristian, Agostino, Francesca and Raffaele. Sharing the same desire to take a challenge and be the main players of their own life, they enthusiastically choose to invest in the leading resource of their town, the pasta. At the beginning the first four protagonists set up an association to promote pasta by organizing many events whereas the remaining two, Francesca and Raffaele, University students, work on several projects linked to this sector. This motley crew, supported by the entertainers of Policoro Project Community of the archdiocese Sorrento-Castellammare di Stabia, decides to turn their idea in a feasible project, but they must deal with real problems. First of all they need a financial support. Francesca and Raffaele can find their share of investment while the others can’t. The Community comes to their aid: the families of the parish give their contribution by lending the remaining amount of the investment, to be paid back in some years with no interests. 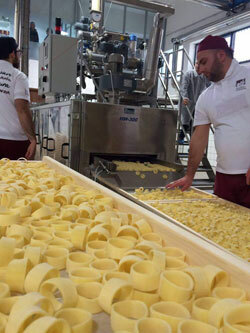 Researches and studies carried out in the pasta sector have guided the choice of state-of-the-art machines, equipped with modern technologies and able to give value to the tradition of Gragnano, Town of the Pasta and making ever-young this precious and ancient craft. The craftmanship of the traditional "Arte Bianca" continues by means of the best selected italian semolina and water springing from the Lattari Mounts. These two elements, skilfully mixed together, create a unique product, which make us proudly feel to belong to the European Capital of Pasta, Gragnano, and rightfully so. The dream came true on October the 2nd, 2015. The features of the pasta of “Mulino di Gragnano”. High-quality wheat: all shapes are produced using the best durum wheat semolina coming from high-quality Italian wheat. After sifting and cleaning it, the wheat is milled in Selezione Casillo Mills and an excellent flour is produced that is subsequently kneaded using water from the Mills Valley spring until it becomes doughy and smooth. The bronze die: the dough passes through specific bronze dies to make rough all shapes of pasta: this is an essential feature to bring out sauces and condiments flavours. A slow drying at a low temperature: thanks to monitored temperature and humidity the drying is slow and thus the pasta maintains all the main sensory qualities of the durum wheat. 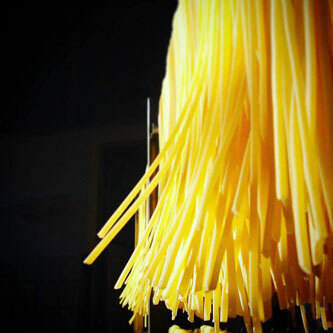 Manual packaging: after the drying, the pasta is brought back to room temperature and stabilized. It is then manual packed in polylaminate cubic-shaped resealable bags, in order to simplify its usage and guarantee its crispness. The choice of the shapes: they are the traditional ones: paccheri, mezzi paccheri, calamarata, pennoni, fusilloni, lumaconi, mezze maniche rigate, mafaldine corte and mafaldine lunghe, spaghetti and fusilli bucati lunghi. The shapes are various but they all have in common the taste of the "Arte bianca" which made the pasta of Gragnano famous worldwide. Raffaele Faella explains why they chose Storci: “the choice of a Company such as Storci arose from the need to turn our ambitious project into reality. We believe Storci is the leader company in the production of pasta machinery, able to realize a traditional production and as a consequence a high quality product”. The results are completely satisfying. 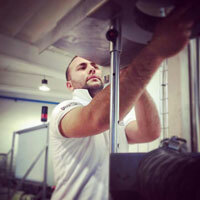 “Thanks to Storci we have successfully reached the right combination of technology and tradition. They have proved to be the only company that can preserve the main artisanal methods, so important and essential to the people of Gragnano, combined with technological innovation. Moreover Storci has embraced and supported our project since its beginning, devoting many months to understand and fully meet our needs, making us self-sufficient in pasta production which after only 4 months , ranks among the finest in Gragnano”. - From "A sua immagine"